Spanish coins with King Alphonso X111, one of the youngest kings ever to be shown on a coin, being just over 6 months old when made king. The 25 Pesetas gold coin is one of the iconic European coins, dating back to the mid 19th century until its discontinuation in 2002 with the introduction of the Euro. 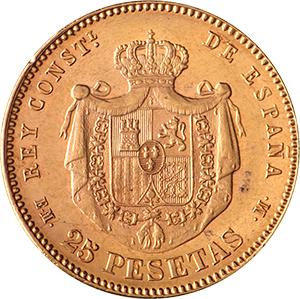 The word Peseta comes from the Catalan word “peça” which translates loosely as “Fraction”. The Peseta has no official symbol, such as the pound sign “£” or dollar sign “$” and can be abbreviated as Pt, Pta, Pts or Ptas. The Peseta was also the main currency of Andorra, along with the French Franc, due to the fact the country had no official currency of its own. First introduced in 1869, in preparation for joining the short lived Latin Monetary union (a sort of precursor to the Euro that disbanded following the first world war) the Peseta was originally made with a combination of silver and gold, although gold made up only a very small percentage of the coin. By 1873, however, the coin was struck using only fine gold. The coin is 21.6 carats, with a gold content of 0.2333 oz of gold and weighing 8.0645g. 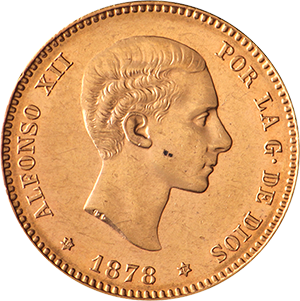 25 pesetas coins showing King Alphonso XIII are unique in that they show one of the youngest kings represented on a currency (he was just a few months old when placed on the Spanish throne). Another unique feature of the peseta is how the coins were dated. Many coins between 1868 to 1982 were marked with the authorisation date, with the actual date found inside a small star, usually on the coins inverse (although occasionally on the inverse). Due to its historic value, not to mention the coins gold content and purity, the 25 pesetas coin has become extremely popular with both collectors and investors in gold coins. This is particularly the case for some of the coin’s earlier incarnations, with over 1m struck at the beginning of the pesetas era.